FAQ - API Cloud - WSO2 Documentation for your Wiki! I have an existing swagger. How can I create my API in API Cloud? How can I create a Mock API? How can I create a SOAP API? How can I use a single API to route to different backend services? How can I use dynamic endpoints, with different credentials for each backend? What content types are supported in API Cloud? What is meant by Context of an API? Why should I add tags for an API? How can I add documentation for my APIs? What is meant by each API resource auth types? How can I display multiple API versions in the API Store? How can I convert a response in the backend from XML to JSON? Why testing backend connection gives an invalid result even if the backend service is available? How do I edit/add a subscription tier to my API? What are the options to search for an API in Publisher listing? How can I delete an API with active subscribers? How can I host my backend for my API? How can I secure the link between my backend services and the API Cloud? How much bandwidth is guaranteed? Would DNS resolution in API Cloud be done inside our network or using your own DNS service? Does your VPN solution have high availability? Do you have replicated VPN nodes? The backend web service does not match the API design that I expect. What should I do? What type of mediators are supported by the API Cloud? What properties can I retrieve from an API using a property mediator within a sequence? How to send a POST request with no payload (no Body) ? How can I disable chunking for my APIs? How to convert incoming and outgoing message formats? How can I view the sequences uploaded to my APIs? Does the API Cloud send outbound calls to On-Prem gateway? How do I monitor the health of the gateways? Is there any default health check APIs deployed on the gateway? How can I generate OAuth bearer tokens for my APIs using On-Prem gateway? Do I need to use WSO2 API Cloud instead? Can I invoke the APIs deployed in the Cloud and On-Prem gateway both? If my backend API endpoint is only reachable on the internal network, does the Cloud allow me to create the API? How can I manage different environments in the application development lifecycle? Can I run multiple On-Prem gateways for the same organization? What is the mechanism of getting the security updates, bug fixes for my On-Prem gateway? Where is WSO2 API Cloud hosted? What are the available global API gateways? How long does it take for a change done in the API Publisher to appear in the global API Gateways? What content types are supported in the API Gateway? What is meant by Error codes received at API Gateway? Why am I seeing an error as “Missing credentials” as my API’s response? Why am I seeing an error as “Invalid credentials” as my API’s response? How to avoid your backend endpoint getting suspended by the API Gateway? How to increase endpoint timeout for an API? How can I subscribe and generate tokens for my API? How can I regenerate access tokens? How can I edit scopes of my API? How can I block a certain user from accessing my API? How can I control the requests which reach my APIs? How can I block subscription to my APIs? How can I invoke my APIs through my developed applications in the integration cloud? How can I migrate my APIs among my cloud organizations? How can I migrate my on premise APIs on API Manager to the Cloud? What are the community features available for the WSO2 API Cloud to market my APIs? How can I change the theme (look and feel) of my API Store? How can I charge my API Consumers(subscribers) for the usage of my APIs? How can I log into the Cloud's advanced Management Console? How can I add new members to my organization? How can I change the role names of the users of my organization? How do I customize Invitation emails for subscribers and publishers of my API Cloud organization? How do I remove a user from a role? How can external users register/sign up to my API Store? How can I connect my on premise user store to the API Cloud? I want to use the LDAP as a secondary user store. How can we map the roles of my underlying userstore to those of the WSO2 API Cloud? How can I connect my own Identity Provider to API Cloud? How can I authenticate subscribers who are not in the WSO2 Cloud user store? Why am I not seeing statistics for my APIs? How can I find the API Gateway logs? Why am I seeing “Could not get the logs at this moment” error on my live log viewer? Why am I seeing “Too much of logs loaded. Please refresh to get new logs” error on my live log viewer? Can we retrieve older version of our APIs from a source control or from the lifecycle? How can we backup our configuration in the API Cloud? How to grant access to WSO2 support team? How can I download the Public Certificate of the key used to sign the JWT Token sent to the backend in API Cloud? What can I do when my custom URL certificate expires? You can use publicly hosted Swagger files to create APIs using WSO2 API Cloud or you can simply upload your swagger YAML or JSON file to create an API without a hassle. You can follow the tutorial on how to achieve this. You can create a sample API with an inline script and then make it available for testing purpose for your API subscribers. You do not need to have an actual service backend but rather mock the response using the inline script. This is provided through the API Cloud’s prototyped API feature. Follow the tutorial on the steps to achieve this. All you need to have is a publicly hosted WSDL and a backend URL and this can be achieved easily in the API Cloud. Follow the tutorial on the comprehensive steps on how to carry this out. API Cloud provides an out of the box feature called the dynamic endpoint functionality. This allows you to dynamically pick the backend to which each call is routed based on the call’s properties. You can refer to this post on how to achieve this. Assuming that you have already designed your API, follow the steps below. Select Non-Secured as the Endpoint Security Scheme in the Implement tab. Provide your credentials for each endpoint. A sample message mediation sequence is given below. There is an authorization header for each endpoint in the sequence. The corresponding backend will be called with its authorization header. API Cloud Gateway servers process requests and responses with the following content types. If you have a requirement to process payloads of other content types, send a support request to the WSO2 Cloud team. Context refers to the URI context path of the API which is case sensitive. The supported formats are listed below. You can use keywords and common search terms as tags to group APIs that have similar characteristics. After publishing the API, consumers can click these tags to jump to a group of similar APIs. Application and Application User: Both application level and application user level authentication is applied. Note that if you select this option in the UI, it appears as Any in the API Cloud internal data storage and data representation, and Any will appear in the response messages as well. Follow the steps below to show multiple versions of an API in the API Store. a. Login to the API Publisher. b. Go to the Management Console (https://gatewaymgt.api.cloud.wso2.com/carbon). c. If you are already logged into the API Publisher, you are automatically logged into the Management Console. d. Once you log in to the Management Console, navigate to the Browse > Resources section and locate the /_system/config/apimgt/applicationdata/tenant-conf.json file in the registry. This can also be done by searching for the /_system/config/apimgt/applicationdata/tenant-conf.json file directly in the Location field as shown below. e. Click Edit as text, add the following properties to the file and click Save Content. e. Save and publish the API. Clicking Test to check the endpoint will send an HTTP head call with SSL for checking if a given URL is serviceable. The HTTP head call is used here as it is a faster way to verify the endpoints. When the backend does not give any response for HTTP head call it returns a 404 error. This does not imply the backend is failing to serve other HTTP request methods as well. Therefore you get an invalid result when testing. Subscription tiers provide the capability to set the maximum number of requests allowed to the API through the subscribers. By default the API Cloud provides 4 tiers Gold, Silver, Bronze and Unlimited. To change these default tiers or to add a new tier follow the below instructions. Navigate to the API Cloud. In the top menu, under the 'Configure' option you will find an item as "Admin Dashboard" in the drop down list. Click on this option which will redirect you to the Admin Dashboard application. In the Admin dashboard application you will see an option as Subscription Tiers in the left navigation pane. To create a new tier, click Add New Tier, specify the required values, and click Save. To edit an existing tier, Select edit, make the changes and save. Go to the Lifecycle tab in the API Overview page. Change the API state from PUBLISHED to DEPRECATED. Change the API state from DEPRECATED to RETIRED. You will be able to delete the API now. See Secure your Backend Services. We do not have any bandwidth limitation on our end. There is a defined idle period. If the connection is idle for more than the given period it will be closed. The connection will be reestablished at the next immediate call, when it is active again. This will be done in our DNS service. However, you need to map the CNAME entry on your end as well. We do not have replicated VPN nodes on our end instead we use the method of having replicated VPN endpoints for automatic fail over which routes to the other endpoint in case one endpoint fails and guarantees high availability. You can extend the default message mediation sequence using mediators. The API Cloud comes with a powerful mediation engine that can transform and orchestrate API calls on the fly. See Change the Default Mediation Flow of API Requests. SYNAPSE_REST_API_VERSION Retrieves the version of the API. E.g., 1.0.0. REST_SUB_REQUEST_PATH Retrieves the sub request with path and query parameters. E.g., "/CheckPhoneNumber?PhoneNumber=1234567&LicenseKey=0". REST_API_CONTEXT or api.ut.context Retrieves the context of the API in the form /t/tenantDomain/context/version for an API. E.g., "/t/tenant/new/1.0.0". REST_FULL_REQUEST_PATH Retrieves the entire request path. E.g., "/t/tenant/new/1.0.0/CheckPhoneNumber?PhoneNumber=1234567&LicenseKey=0". TRANSPORT_IN_NAME Retrieves the transport. For example, "https". SYNAPSE_REST_API Retrieves the name of the API. For example, "admin-AT-tenant.com--NewAPI:v1.0.0". See this tutorial to get an idea on how you can use a property mediator within a sequence to change the default mediation flow of API requests. Also, see Property Mediator in the ESB documentation. When carrying out a POST request from the API Cloud to the back-end ,API Cloud expects a request body parameter to be present.This is the default behavior of ESB/API Manager. But in case we need to do a POST request with no body we set the property in the in sequence of the API. Setting this property in a custom sequence will allow to do a post without body. However when we set this API cloud will send its default content type which is application/x-www-form-urlencoded and do the post request with no body. We cannot remove the content type completely but we can change the value of it using a property as mentioned below. This can be done with the use of a custom mediation extension which will disable chunking, as described below. Save the content below into an xml file and upload it as the In sequence of your API from the API Publisher. Refer this post on how to add custom sequences to the WSO2 API Cloud. You can change the message formats of your requests in the API Cloud. For this we use synapse which is a powerful mediation engine. For more information, see how to Convert a JSON Message to SOAP and SOAP to JSON. Download and install the WSO2 API Manager Tooling Plug-in if you have not done so already. Open Eclipse by double clicking the Eclipse.app file inside the downloaded folder. Go to Preferences > Developer Studio > WSO2 APIManager in the Developer Studio and change the Default sequence location to /_system/governance/apimgt. Restart the Developer Studio to apply the changes. No. The On-Prem gateway only invokes the REST APIs of API Cloud to synchronize API definitions of your organization, update statistics on your API usage and update the health status of the gateway. You can configure your health check monitoring tool to send a request to http://localhost:8280/services/Version endpoint. You can generate tokens connecting to the On-Prem gateway token endpoints as well as API Cloud gateway token endpoints. Yes. If the backend API endpoint is reachable from Cloud gateway, you can invoke the API from both gateways. Yes. You are required to register multiple organizations corresponding to each development stage and run multiple On-Prem gateways for each organization. Yes. If you are running multiple On-Prem gateways on the same node, set an offset value(<Offset>0</Offset>) in [On-Prem Gateway]/repository/conf/carbon.xml file to avoid port conflicts when gateways start. You can contact cloud@wso2.com for the exact details. WSO2 API Cloud is hosted in the AWS US East data center. For compliance or performance reasons, paying customers can choose alternative locations for their API gateways in API Cloud. These include Canada, US West, Brazil (São Paulo), EU (Ireland), EU (Frankfurt), Singapore, Tokyo, Sydney, Seoul, Mumbai, and Beijing. It takes a maximum of 10 minutes for a change done in the API Publisher to appear in the global API Gateways. This is due to the artifact synchronizing task that runs every 10 minutes. The Reason you are seeing this error is since you have not provided the OAuth token for invoking your API. It could be due to one of the following reasons. You have not yet subscribed to the API. If you have not yet subscribed to your API follow this tutorial on how to achieve that. You have not selected the correct application which you subscribed the API to - Perhaps the application selected from the dropdown in the API console is not the actual application which you subscribed to and hence the reason the keys are not appearing for your application. Select the correct application from the list and then invoke your API. The reason you are seeing this error is since the provided access token is invalid or the provided access token has expired. Please follow these steps in order to re generate the access token. After which you would be able to invoke the API successfully. Go to API Publisher and select the API that you want to change. Then click Edit from API Overview. Under the Implement tab, select Advanced Options on the endpoint which you want to re-configure as shown below. Modify the values. If you want to disable the suspension rules, set both Initial Duration and Max Duration to 0. Save changes and re-publish the API. The warning "a callback is not registered (anymore) to process this response" indicates that API gateway has received a response from backend server after exceeding the endpoint timeout duration. So, the gateway was unable to handle the response. You can increase the endpoint timeout as follows. The endpoint timeout is set to 30s by default. Modify the value to increase the connection timeout. Please note that the maximum allowed timeout is 2mins as API gateway has a global timeout value of 2mins. You subscribe to API using the API Store. Follow this tutorial to subscribe and invoke your API. Follow the below steps to re generate the access tokens for the applications for which your APIs are subscribed to. 1. Navigate to the "Applications" option which is found at the top left hand corner of the Store UI and click it. This will take you to your applications page. 2. Select the application which your API is subscribed to and go to the Production/Sandbox Keys tab. 3. Click on Re-Generate button. 4. Now that you have regenerated the token you will need to go back to the API. In the top menu where you selected the Production Keys tab you will see an option as "Subscriptions". Click on that tab and select your API. 5. Now you will be able to invoke your API successfully. In WSO2 API Manager once you have created scopes you are not able to edit the scope using API Publisher UI. Using swagger console you can achieve this with following below steps. 5. Save the API which will deploy the API with the respective roles for the scope. 6. Then you will see the scope updated. 3. Select the condition type as the user and give the fully qualified username as the value and click to blacklist. For example, if you want to block the user cloud@wso2.com from invoking APIs, you have to provide the value as cloud@wso2.com@cloudorg by appending the organization key at the end of the username with the '@' character. 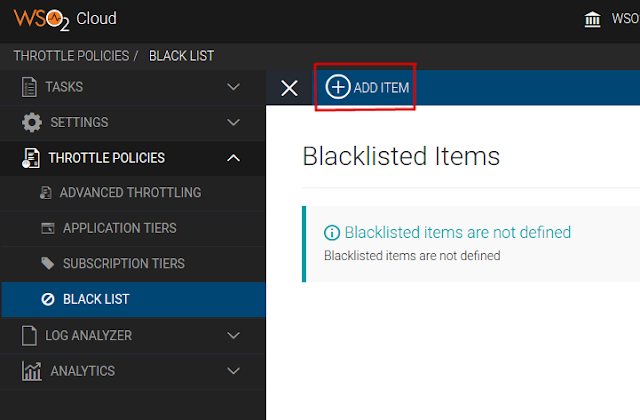 If you follow the above steps, the user will not be able to invoke APIs until you remove this the blacklist policy. For information on different levels of throttling in WSO2 Cloud, see Throttling tiers. For more information on configuring throttling for your APIs refer this tutorial. An API creator blocks subscription to an API as a way of disabling access to it and managing its usage and monetization. If you want to block any subscriptions created by your API consumers all you need to do is follow the simple steps explained in the tutorial. The applications deployed in WSO2 Integration Cloud can consume the APIs created in WSO2 API Cloud. Follow this tutorial on how to achieve this. If you want to duplicate the APIs among your cloud organizations this is possible with the API Cloud. This will reduce the hassle of having to recreate the APIs in each organization for you. Please follow the tutorial on how to achieve this. If you have APIs created on your local instance of WSO2 API Manager you can simply follow this tutorial to migrate them to your cloud organization. The API Store provides several community features to build and nurture an active community of users for your APIs. This is required to advertize APIs, learn user requirements and market trends. The following are some of the community features available in the API Store. You can refer the tutorial on more information. API Cloud provides the capability of customizing the default theme of the API Store to make it more appealing and personalized. Changing the theme is pretty simple and easy to do yourself. You can follow the tutorial on how to change the theme of your API Store in the API Cloud. Not only can you allow users to use your APis you can now charge them as well with the Monetization feature of the API Store. This feature allows the API publisher to customize the patterns of monetization. You can read more on the monetization feature in the article or simply enable the feature following the tutorial. In most cases, default user interfaces are sufficient for your administrative tasks. However, there are some scenarios, such as adding new user roles, that require the use of the advanced Management Console. Such scenarios are indicated in the corresponding documentation articles. You can log into the API Gateway's advanced Management Console using the URL https://gatewaymgt.api.cloud.wso2.com/carbon. You can simply invite members to your organization by providing their email address and the desired role you want them to be invited to. You can follow the tutorial on how to achieve this. You can achieve this using the custom role feature of the cloud. Simply follow the steps mentioned in this tutorial to achieve this task. There are mainly two methods of how external users can be members of your cloud organization. You can simply remove a user from a role by following the below steps. For example, let's say you need to remove a user from an API subscriber role. 1. Click on the 9 square menu icon which is at the top right corner of the webpage https://api.cloud.wso2.com/publisher/. 2. Click on the Members button. 3. Select the user and click the edit button. When you click that, a list of available roles of the user will be shown. 4. Uncheck the checkbox corresponding to the subscriber role of the user. You can directly connect your internal LDAP user stores to the API Cloud. This allows you to provide authentication for users in the LDAP, without sharing the credentials of the LDAP with WSO2 Cloud. Follow this tutorial on how to connect your on premise user store to the WSO2 Cloud. In the WSO2 API Cloud we can plug in any on premise LDAP secondary user store as mentioned in the documentation.The user needs to provide us with the roles which maps to the roles in their underlying userstore and the mapping would be done for them. The following are the main 4 roles in the API Cloud for which your userstore roles can be mapped against by us. If you want your organization to link their IdP to WSO2 Identity Cloud to provide SSO-based authentication for API Cloud apps you can refer the below tutorial on how to achieve this with WSO2 Cloud. You can follow one of the two options below to achieve this. There is a directory or database containing the identities. The application gets the username and password from the end-user and needs to use them to fetch the OAuth2 token and then invoke the APIs. Please refer the tutorial for further information on this use case. The gadgets listed below do not display real time statistics.They are refreshed in time intervals to display the the latest statistics generated, and the data scripts used to update them may take 10-15 minutes to be executed. Following are the time intervals each gadget is updated. Read more on API Cloud statistics here. a. Log in to WSO2 API Cloud. b. Go to the API Cloud Admin dashboard (click Configure > Admin Dashboard). c. On the left navigator, click Log Analyzer > Live Log Viewer to view your recent logs on the WSO2 API Gateway. Your current browser session might be corrupted due to some browser actions. Refresh the browser to view the logs. Your browser session may have expired or cleared. Log out from the API Cloud and log in again. It may take some time to retrieve the logs the first time. So if there are any corruptions during this interval, it may lead to this error message. Refresh the Live Log Viewer page and try again. If you are getting an error similar to the above, it means that you have reached the maximum limit of log lines during your current session. The limit of the log lines is very large and sufficient for debugging. Refresh your browser to view the latest logs. You would need to maintain this yourself by using versioning which we provide in the API cloud as a feature. There is no out of the box way in which individual users are able to backup the configurations since this is a shared environment hosted in the cloud. However we guarantee that the configurations are not lost. API Cloud has an implemented backup strategy to ensure no loss of data under any circumstance. What are the limitations of my API Cloud trial subscription? How can I purchase an API Cloud Subscription? After your trial expires, click on Trial Expired on the toolbar and select Purchase Subscription. Enter your details in the subsquent form, shown below. An account manager will get in touch with you within a day. Each tenant in WSO2 Cloud has their own private key and it is used to sign the JWT token. Follow the steps below to get a public certificate. First, go to the Cloud's advanced Management Console and log in as your tenant admin. Click List under the Main > Manage > Keystores section. Click Public Key to download the Keystore's public key. You can redo the steps in Customize Cloud URLs with the updated certificate.